Here's my partial list of those sources I've found most useful in dealing with Roman Catholicism. Rather than post as many sources as possible, I've picked only those that have been the most helpful to me over the years, and those that are typically layman friendly. It's often not the number of sources one has, it's their clarity and usefulness. I've included some audio debates and lectures as well. Picking audio choices is unfortunately like counting sand. It should go without saying that I've been heavily influenced by the work of Dr. James White (as this list will show), particularly his many live debates and Dividing Line broadcasts. I've been listening to Dr. White's shows, sermons, lectures, and debates on Roman Catholicism since somewhere around 1998-1999. 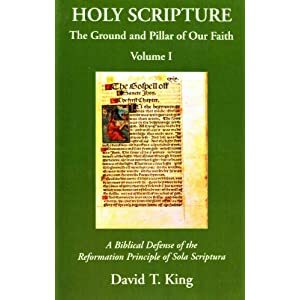 David King and William Webster, Holy Scripture: The Ground and Pillar of Our Faith, Volume III: The Writings of the Church Fathers Affirming the Reformation Principle of Sola Scriptura. Alister McGrath, Iustitia Dei, A History of the Christian Doctrine of Justification(Third Edition). Louis Berkhof, Systematic Theology (New Combined Edition). See Part Four: The Doctrine of the Application of the Work of Redemption, pp. 415-554. James White, Is the Mass a Propitiatory Sacrifice? James White, Did Mary Have Other Children? James White, How Biblical and Ancient is the Papacy? James White, Was Peter a Pope? I see Sproul is coming out with a new book "Are we Together"...which discusses Roman Catholicism. Looks like a shorter book, 120 pages or so and deals with Scripture, Justification, Sacraments, Church, Papacy and Mary. I haven't kept up with all of R.C. Sproul's books. I will say though, his books are typically clear non-technical treatments of very complicated issues, which is why he's so popular! I would assume this book will echo many of his points in his earlier recordings (like the series I've linked to of his in this blog post). R.C. recycles some of his material at times- which can be good, and makes sense (you'll know you're fluent in "RC" when you know the end of one of his stories before you get to the end of the story). I, like many serious Reformed people, have a fairly big collection of Sproul materials. He was one of the first Reformed writers I ever read, and I certainly hold him in high regard. Yea, on ligonier's website, you can find around a 40 page preview of this book (intro, forward (Horton), chapter 2 - justification)...and after reading it, I did not recall anything new that I have not read in his book "Faith Alone". Perhaps the only thing I do not remember, is a few comments that Rome does in deed incorporate "imputation" to some degree within its doctrine on justification. Maybe Sproul mentioned this in "Faith Alone" and I just don't remember though. I have a special affection for Sproul since he convinced me of a few Reformed truths (predestination, infant baptism, and a few others). I remember in college accidentally coming across him, and really could not get enough of him. Though raised Lutheran, going to non-denom, to Reformed, and now back to Lutheran...Sproul will always have a unique place on my bookshelf! My list of recommended material for learning about Catholicism would be the Bible, the ecumenical councils, the Catechism of the Catholic Church, the Catechism of the Council of Trent, Augustine, and the writings of the popes. I also think Nick Needham's book on Augustine's view of salvation is an excellent compilation from Augustine's writings, that whets one's appetite for more, and yet doesn't require 5 -10 years (with life's responsibilities) of trying to master all his works. Some are still not translated into English, amazingly. One has to be a monk and learn Latin to get all of them under his belt. The Triumph of Grace; Augustine's Writings on Salvation Grace Puplications, London, England, 2000. I tried to keep non-technical sources in mind, as well as materials that didn't make it on to Dr. Clark's list. Perhaps we can coax TurretinFan into doing a list, and feel free to do one yourself. Thanks for the excellent resource list. As a former RC and now LCMS Lutheran with a degree in Christian apologetics I have found many of these to be very useful in my work. You've also pointed me to several I was unaware of. Well done!